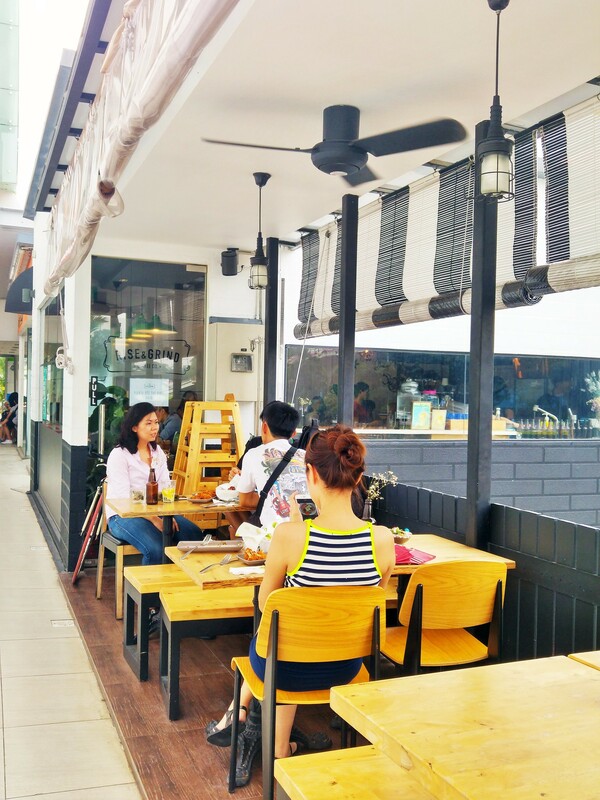 SG Food on Foot | Singapore Food Blog | Best Singapore Food | Singapore Food Reviews: Rise & Grind Coffee Co @ Bukit Timah Plaza - Excellent Coffee, Fresh Ingredients & Heartfelt Service. 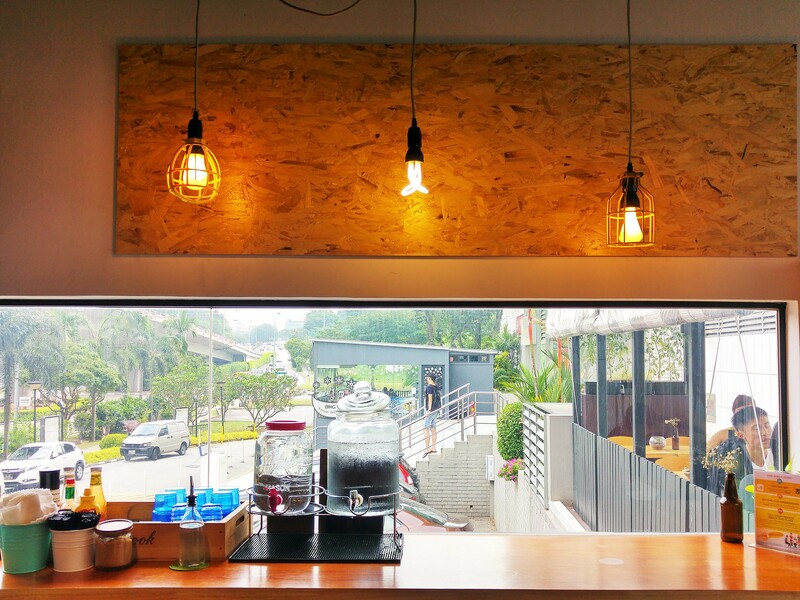 Rise & Grind Coffee Co @ Bukit Timah Plaza - Excellent Coffee, Fresh Ingredients & Heartfelt Service. Near the entrance of Bukit Timah Plaza is a row of shops built on a elevated ground, looking somewhat like Hobbit houses, but urbanised. One of which belongs to the team of Rise & Grind Coffee Co, since April 2015. Barely 700 square feet including an alfresco area, the compact space houses quite a sizeable kitchen, which explains the simple industrial furnishing- cement flooring, bare ceiling with a few drop light bulbs. The sofa seats at one side, though narrow, appeared extra cosy. Every inch matters indeed. Perhaps due to the limited seating spaces, I was offered by the crew a basket for my bag, taken from a stack of at the entrance. That is what service is all about. Their menu impresses me, as I caught sight of ingredients such as Halumi Cheese, Salmon roe, 63 degrees egg and grass fed ribeye steak. We ordered their newest creation Pulled pork Benedict ($15), their most popular pasta Tom Yum Seafood ($17) and the lady boss's favourite Burger The Gold Standard ($18). 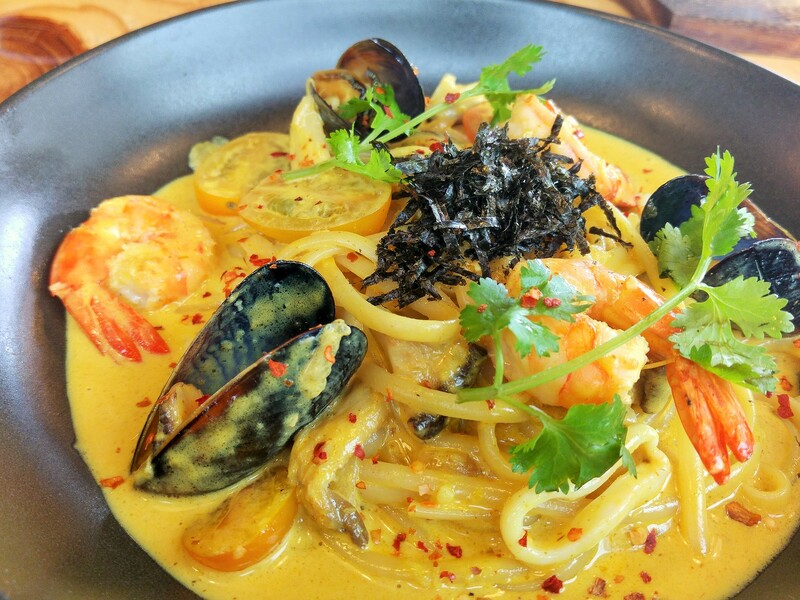 Among these three mains, our favourite is the Tom Yum Seafood Pasta. It is way more stimulating than any salted egg yolk pasta. The sauce, fragrant with lime leaves, lemongrass, clings onto the spaghetti nicely. It is a little spicy, with creaminess rounding out the tangy edges. What gives the sauce its depth of flavour, which I found out later, is the shrimps stock which they have prepared by cooking the prawn shells for hours before reducing it to a flavourful base. No shortcuts. The prawns were succulent and squids were chewy, and its vibrant orange red makes this dish ever more appetising. Not to forget the stems of parsley that adds a great touch to the flavour. The nori does little to the taste, but it reflects the culinary background of Chef Charles, the soul behind kitchen, who is French trained but with strong Japanese influence. 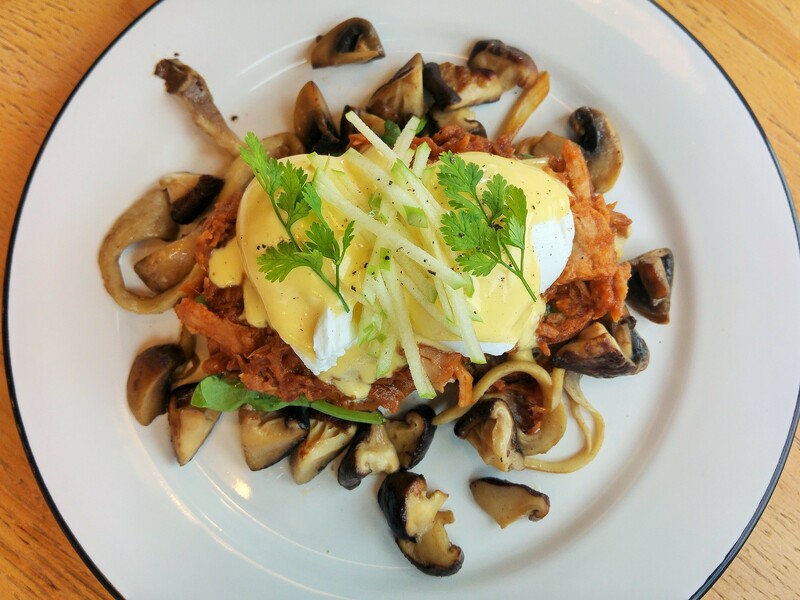 Breakfast & Brunch is no longer just about cured meat, eggs, sausages and Hollandaise sauce with their newly created Pull Pork Benedict. Although this is not exactly something new, but they did it the right manner. The pork shoulders is slowed cook overnight for 24 hours, cooking and soaking in its own flavours and lard, like a confit. It's not at all greasy, trust me. Combined with perfectly poached eggs, I'm quite certain that this will win the hearts of men who always see egg benedict as more of a light snack. I thought my added sautéed mushrooms was pretty tasty too, with a hint of wine along with its earthy taste. 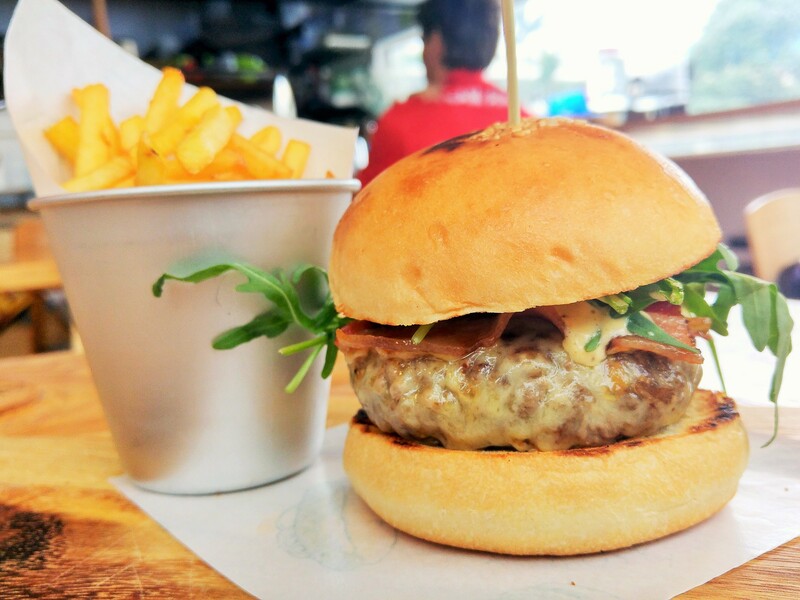 As for The Gold Standard, it is above your average cafe burger but I feel there is still a bit of distance before it reaches the gold standard. The patty is juicy, but I find the brioche bun a little too dense. Smeared with in house garlic & chive aioli, I appreciate the flavour and the tang fired from the sauce, but it doesn't excite my appetite as much as I want it to. The truffle fries was lovely, which is of the right cut and fried till crisp. You may also opt for the lighter side if you are here during the mid day. 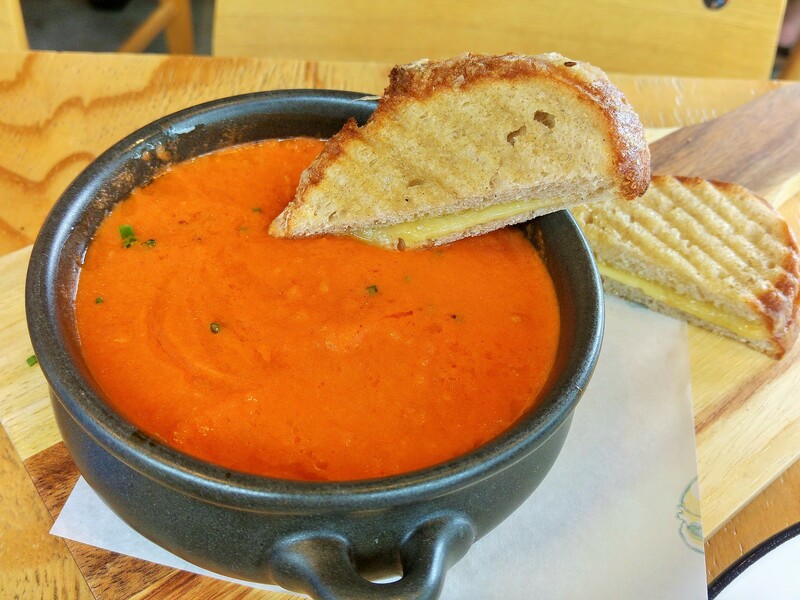 Roasted Garlic Tomato Soup ($8) is a very hearty soup combined with grilled cheese toast. I like its thickness, which is almost like a stew. Perhaps, some basil to punctuate its richness would be good. If not for the cream, I would have really loved it. 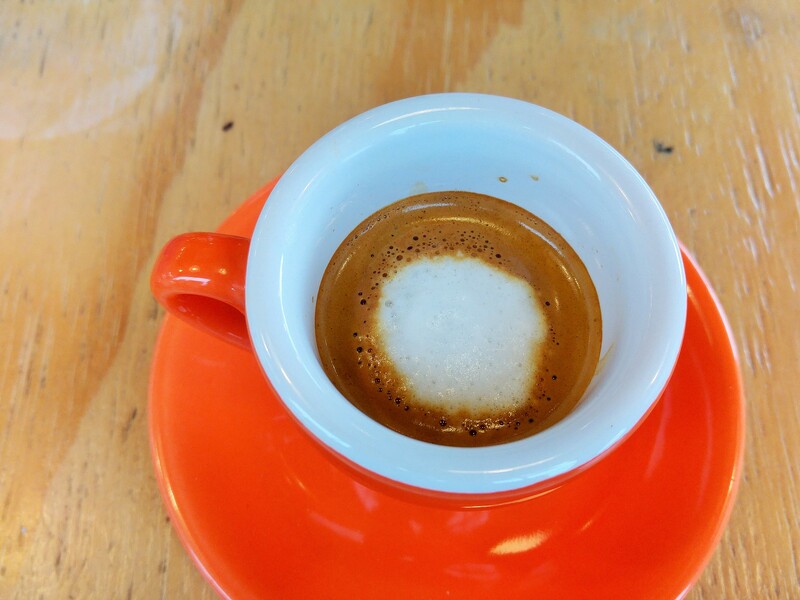 Single origin coffee from Dutch Colony is served it, you can go for 3oz, 5oz or 7oz with milk. I like the simplicity of it. Almost a year on, Rise & Grind Coffee Co already has their pool of regulars who see them as an ideal gathering place, which explains the crowd when I was there on a weekend. Not just youngsters, but families too. They might have something special coming up in conjunction with their 1 year anniversary, hence do look out for it! Photograph and written by Si An. A girl who is allured by travelling, loves the feel of freedom, smell of the rain and the aroma of fine coffee and food.